When the Chandra X-ray Observatory celebrates a launch anniversary, it goes big with exploding stars and rotating neutron stars. Today marks 15 years of precision X-ray investigations of stars, galaxies, black holes, neutron stars, and even dark energy. NASA celebrates with supernova and pulsars. Chandra is a space telescope launched on July 23, 1999 on the Space Shuttle Columbia as the heaviest load ever carried into orbit by the space shuttles. From low Earth orbit, it was boosted even farther by the Inertial Upper Stage, a two-stage rocket. Now the spacecraft moseys along in an elliptical orbit, heading out to more than a third of way to the moon at a massive 139,000 kilometers away from the Earth before swinging back around to skim just 16,000 kilometers over the planet. This unusually eccentric orbit allows the spacecraft to put in long observing stints unobscured by Earth's shadow. The Chandra X-ray Observatory makes up one fourth of NASA's four Great Observatories, along with Hubble Space Telescope, Spitzer Space Telescope, and the Compton Gamma Ray Observatory. Originally dreamed up under the name Advanced X-ray Astrophysics Facility (AXAF), in 1976, the telescope was renamed to honour the late Indian-American Nobel laureate and astrophysics Subrahmanyan Chandrasekhar before it ever left the planet. The telescope bares his nickname Chandra, which fittingly translates from Sanskrit as "moon" or "luminous." You might recognize his name from astrophysics, as the Chandrasekhar limit is the upper limit on how massive white dwarf stars can be. The spacecraft carries the most powerful X-ray telescope in the world, spying on objects 1/20th as faint as could be detected by the next-best telescope. It not only has the sensitivity, but also the resolution, as Chandra is capable of resolving to the nearest 0.5 arc seconds. That's the equivalent of being able to read a stop sign from over 19 kilometers away, or reading a 1-centimeter headline from 800 meters away. Common targets for the telescope include jets and accretion discs of black holes, super-dense neutron stars whirling out fingers and rings of high energy particles, supernovaremnants, and the structure of galaxy clusters. So far, the telescope has identified roughly half a million X-ray sources, and may have even spotted the signature of dark matter, although that's still under investigation. 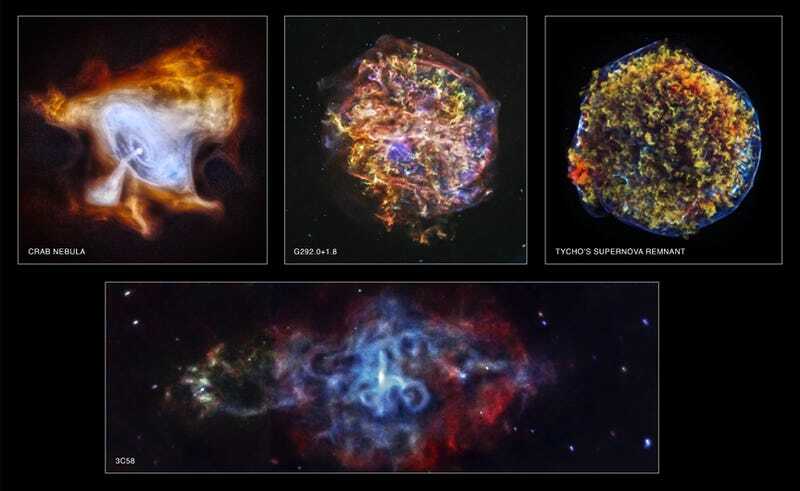 To celebrate the 15th anniversary of Chandra's launch, NASA has released a new set of X-ray images for us to ogle: the first pair trace out the expanding debris and shockwaves of supernova remnants, while the second pair highlight the clouds of high-energy particles produced by pulsars. Tycho in X-ray light. Shock waves push out a shell of of high-energy electrons [blue] and compress expanding gas from the stellar explosion [red & green]. Image is 36 light-years across. Named for the Danish astronomer who first observed it, Tycho is a supernova remnant 13,000 light years away in Cassiopeia. The remnant brightly glows in X-ray light, vaguely resembling a psychedelic sponge or globby wet moss. The supersonic explosion of the supernova triggered two shock waves: one moving out into the interstellar gas as a rapidly moving shell of high-energy electrons, and one closing in on the expanding stellar debris. Shock waves like this one might be responsible for bombarding our galaxy with the constant shower of cosmic rays. The chemical composition of this remnant includes oxygen [yellow & orange], magnesium [green], and silicon and sulfur [blue]. Image is 66 light-years across. The oh-so-catchily-named G292.0+1.8 is unusual in that it's a local supernova remnant with a whole lot of oxygen. It's complexity of structure matches that of its name, layers of wispy colour displacing each other in a maddening twist of hot gas. At 20,000 light years away in Centaurus, G292 is one of just three oxygen-rich supernova in the whole Milky Way. That makes it interesting because supernova like this one are part of why the poetic claim "We are all made of stardust" is scientifically accurate: it's a primary source for heavy elements. Any element heavier than hydrogen and helium was built by stars. Chandra allows us to identify those elements, teasing out the structure of the star from the remnant left behind. Low-energy [red], medium-energy [green] and high-energy X-rays [blue]. Image is 8.7 light-years across. The Crab Nebula is about 6,500 light years away in the constellation Taurus. The Crab Nebula is the cool kid of astronomical phenomena, a painfully popular target for astrophotography since it exploded in 1054 AD. At the center of the expanding cloud of gas is a rapidly rotating neutron star: a pulsar. The pulsar spews out high-energy particles, painting a portrait of variable energy X-rays for Chandra to spy on. Low-energy [red], medium-energy [green] and high-energy X-rays [blue]. Image is 35 light-years across. 3C58 is 10,000 light years away in Cassiopeia, and is far prettier than its unashamedly bland name. 3C58 is the Crab Nebula's kid sister, a supernova that exploded in 1181 AD. Like the Crab Nebula, its heart is a spinning neutron star. This pulsar is engulfed by a torus of X-rays, blasting jets trillions of kilometers long. The lobes tattle on the pulsar's capacity to produce not just a blizzard of high-energy particles, but also intensely powerful magnetic fields. "Chandra continues to be one of the most successful missions that NASA has ever flown as measured against any metric – cost, schedule, technical success and, most of all, scientific discoveries." Happy birthday, Chandra. I love each new beautiful mystery you present to us as a challenge to understand the intricate workings of the universe. May your mirrors stay smooth, your detectors cool, and your spacecraft steady for many years to come. Image credits: NASA/CXC/SAO. In each of the composite images, the colour mapping is the same as for the Chandra X-ray image, plus a layer of optical light in white as imaged by the Deep Sky Survey. Get large resolution versions of any image from this Chandra repository.